This picture of the School was taken in 1996 for the cover of a book compiled by members of the local community to mark the celebrations of its centenary. The book was edited by the school's current Principal, Donal Carey, and Ann Hyland and Moe Mullin. While documenting the many significant achievements of the school, it is an invaluable record and history of local customs and practices that are no longer part of the way of life of the local community. For many years I had clung to the memory of many of the local customs and practices, but as the years passed more and more of those memories passed away with them. Now, thanks to this book, I can revisit them at will. These schools were finally crushed at the end of the seventeenth century. Under the Penal Laws established by William of Orange and enforced until Daniel O'Connell won Catholic emancipation for Ireland with the Catholic Emancipation Act becoming law on 13th April 1829, Irish Catholics were forbidden to receive education, play any form of sport, enter a profession, hold public office, engage in trade or commerce, live in a corporate town or within five miles of one, own a horse of greater value than five pounds, purchase or lease land, vote, attend Catholic worship, be a guardian to a child or leave one's children under Catholic guardianship. 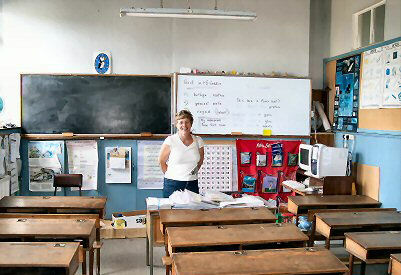 But the Irish love of learning was unquenchable. Defying the English laws, Irish schoolmasters continued to teach in secret under the hedges or in what were called hedge-schools where one of the students or parents was constantly on guard against approaching English soldiers. While the Irish language remained the language of the mass of the people, the history and traditions of the country would remain familiar to them. So much were the classical languages of Greek and Latin part of what was taught that many Irish spoke Irish, Latin and Greek indifferently. This then was the situation before Catholic emancipation and the establishment some years later of the national system of education which ultimately led to the building of the Gortjordan National School in 1896 in order to cater for the educational needs of children in the local area. While my father, Pat Coleman, and his two brothers, John and Jim, and his sister, Mary, attended the National School of The Neale, my uncles, John and Jim, transferred to Gortjordan when the family relocated to Cahermaculick. They would have crossed those same fields twice daily that my brothers, sisters and I crossed a few decades later to get to school. The aerial photo below shows the school in relation to the village of Cahermaculick. The names of the homesteads were those families that made up the village in my time. The path we followed across the fields from 1. to 2. on the aerial photo began with our crossing over a style into Casey's field at O'Brien's corner and through a gate into another of Casey's fields and then over another style into Murphy's fields. 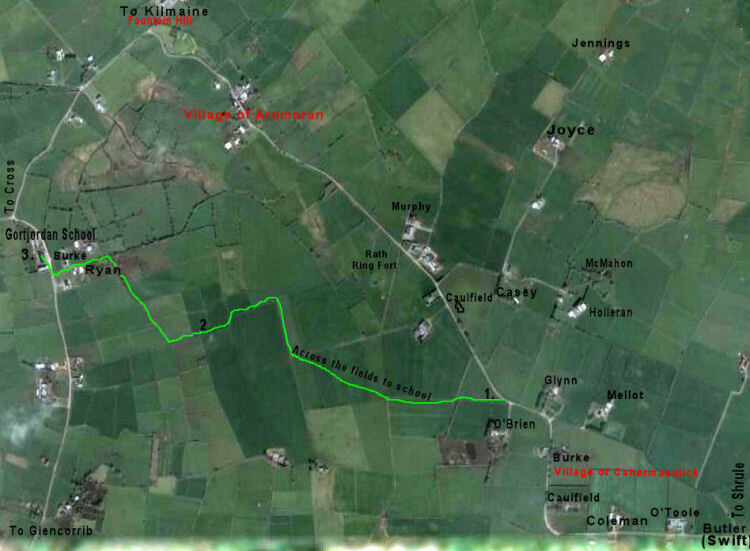 To complete the trip, we travelled along a boreen from 2. to Gortjordan School at 3. We normally followed the headlands adjacent to the stone walls as tillage was very much part of the scene back then. As well as the grain crops of wheat, oats and barley, there were fields with drill after drill of potatoes, cabbages, lettuce, scallions, swedes and turnips. I used to love to see those crops as there was something very attractive and profusely wonderful about them in their rich and natural state there in the fields. I feel quite sure that uncles John and Jim, like the rest of us, would have helped themselves occasionally to a discrete sampling of the scallions, lettuce and swedes when the temptation got the upper hand. Despite the fact that the local farmers were obviously quite tolerant of our actions, one incident in particular stands out above all the rest. As I have mentioned elsewhere, just about every home had its own fine orchard that was rarely immune to our presence. Willie Ryan who lived close to the school would from time to time hand out apples to us as we passed his place on our way home from school. One afternoon, however, the smell of fresh apples piled up on the floor of his little barn by the boreen was too inviting to pass up. But before we had time to escape to secure ground, Willie Ryan arrived on the scene with his shotgun which he immediately discharged over our heads. Not wanting that sort of scare ever again, we quickly put his little barn out of bounds. I don't believe we ever mentioned the incident, or at least for a very long time, to our parents. After a lot of rain and particularly after heavy snowfalls in winter, we took to the road through the village of Ardmoran and around to Gortjordan. It didn't matter between April and October as we didn't wear shoes then but things were different in winter. There is always something appealing in weather changes be it to sunshine, rain, frost or snow. One afternoon on our way home from school, we the kids from Fountain Hill, Ardmoran and Cahermaculick stopped by the last field on the right before our turning right for Ardmoran. The very significant hollow along the centre of the field was full of water and what's more it was frozen over by the first real frosts of winter. So the scene was set for some fun, some skating and some challenges. We were used to the distinctive sounds and movements of ice under weight and usually knew when to call a halt or so we thought. About ten of us including John Flannery from Ardmoran joined hands and proceeded in a straight line to cross the frozen water to the other side. The echoing shrieks and slight movement of the ice under our weight seemed manageable as we approached the centre and deepest section. Then suddenly it gave way plunging us into the freezing water with only one swimmer among us, John Flannery. The water was over our heads and to this day I've been unable to work out how he managed to drag us all to safety. Many years later when I met up with John in Sydney and we were spending a couple of hours together at Cronulla Beach, John happened to refer to the incident which he said had often crossed his mind, and like me he was at a loss to work out how he had saved us all. 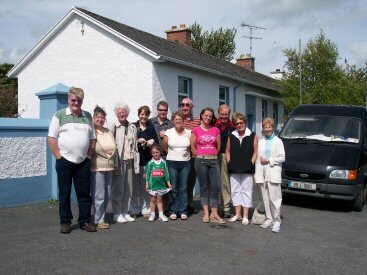 During the Clan Coleman Reunion in August 2004, we had arranged to visit those places close by that featured prominently in the lives of our ancestors, and particularly in the early lives of Mary, Pat, John and Jim Coleman. 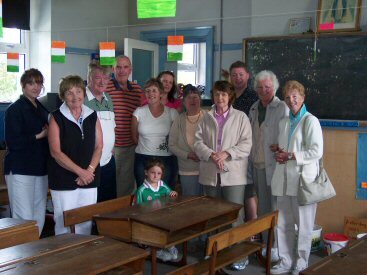 This picture shows us in the fourth class classroom of Gortjordan National School where John and Jim Coleman finished their primary schooling. John settled in England in 1936 and Jim in Montreal in 1931, and so I was delighted to be able to take John's children, Patrick and Linda, his grand-daughter, Clair, and great grandsons, Jack and Max, to this fine old school. I was equally delighted to have with me Jim Coleman's daughters, Mary Meehan and Martha Caluori, and his grandson, Kevin Meehan. As this was also the school which my brothers, sisters and I attended in the 1940's and '50's, it was a good feeling to return there once more. In the picture from the left are Colette Devcich, Mary Coleman, Patrick Coleman, Mick Coleman, Linda Downie, Clair Timms, Barbara Coleman, Patricia Coleman, Kevin Meehan, Martha Caluori and Mary Meehan. Sitting at the desk is Roisin Naughton, Mick and Mary Coleman's grand-daughter from Shrule. It was great to have my cousin Colette, very knowledgeable and helpful in local matters, along as well as my brother, Mick, and his wife, Mary, and of course my wife, Patricia, who was born and reared in Sydney.